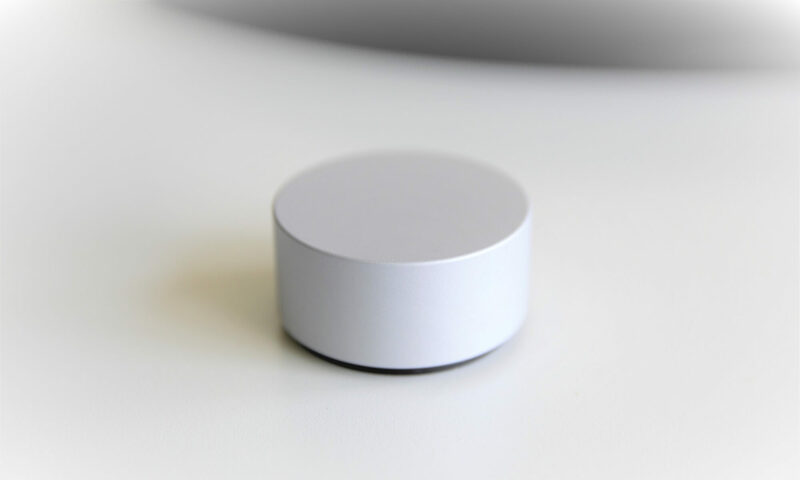 At the Microsoft Build Tour in Vienna, I had the opportunity to present an enhanced version of the Bluetooth Beacon talk. With the Windows 10 Creators Update, Microsoft released a massive update to the Bluetooth LE capabilities of the OS. This finally allows developers to use the full potential of modern Bluetooth scenarios, including sensors, wearables and beacons. Even though the sessions reference example code and blog posts that should have been released together with the session recordings, still none of that is available so far. That gave me the opportunity to explore the new APIs based on the short documentation overview page and the videos. What’s New for Bluetooth in Windows 10 Creators Update? So far, Windos was only capable of using Bluetooth LE in GATT Client / GAP Central role. Arguably, that’s most important for Windows devices – it’s made for phones / PCs that access remote sensors. 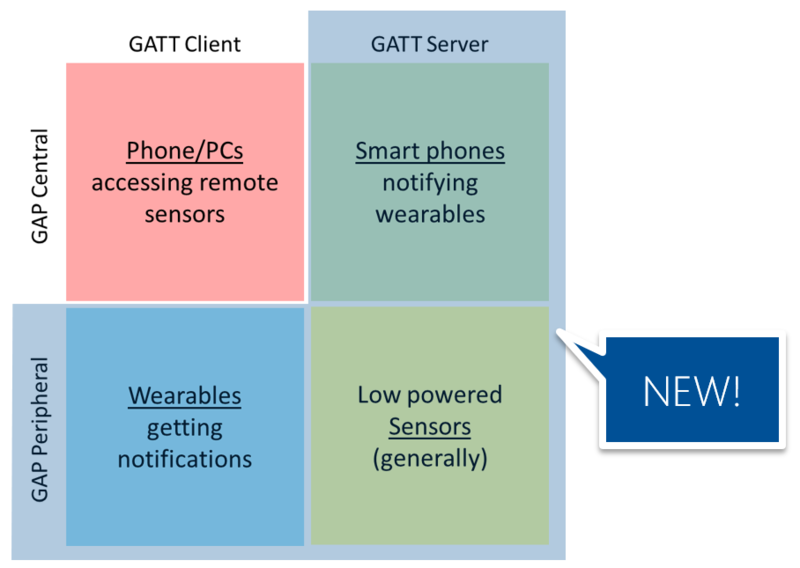 However, if a device should notify a wearable like a smart watch when an incoming email arrives, it needs to support the GATT server role. For actually implementing IoT scenarios, the GAP peripheral role is also needed. Now that the new Windows version has rolled out, it’s possible to actually ship applications that support the new APIs. After you’re sure that your hardware supports the required features, let’s check how to read the battery level of a Kontakt.io Bluetooth Beacon or a (paired) Microsoft Surface Dial. This requires connecting to the Bluetooth device (which isn’t the same as the more permanent pairing!). Then, you need to find the battery service, which contains the battery level characteristic, which in turn has the battery level value. First, you obviously need to know which device to connect to. This is a normal Bluetooth device discovery that has been available for some time. For an example, check the Bluetooth Beacon Interactor open source app, which is part of the Universal Beacon library. For connecting to the device, we need the bluetooth address (which is returned from the device discovery). Use this to connect – which is an asynchronous process. After you’re finished working with the device, you should dispose of the BluetoothLEDevice . Therefore, I’d recommend to add the using statement, which automatically disposes of the object at the end. Now that we have connected to the Bluetooth LE device, we need to check which GATT services are offered by the device. 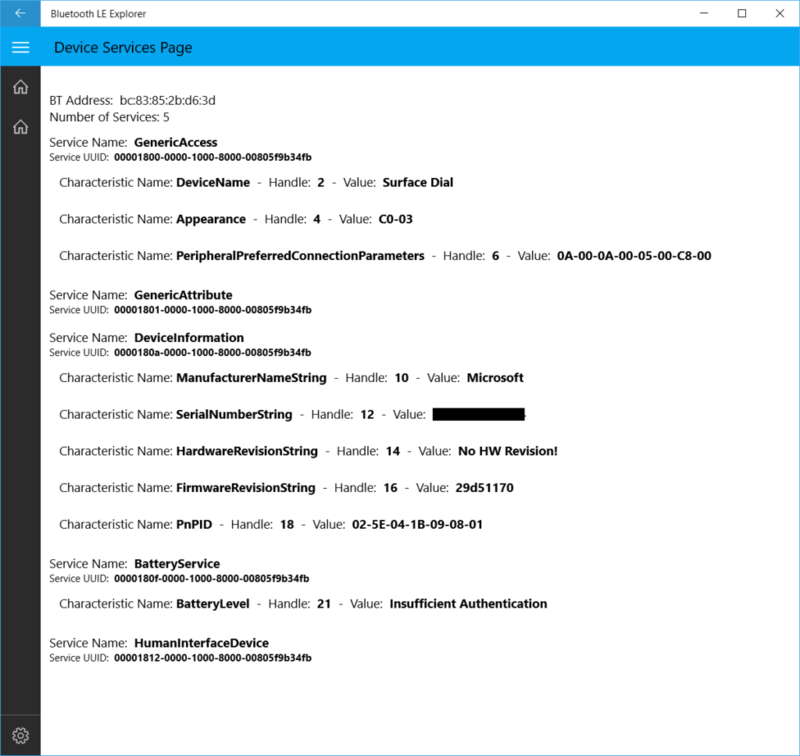 There are standardized services by the Bluetooth SIG, but you could implement your own. In our case, we want to read the battery level of the remote device. This is a standardized service that’s implemented by a lot of Bluetooth LE devices – e.g., the kontakt.io Bluetooth Beacon or the Surface Dial. Also many Bluetooth Heart Rate belts implement the service. 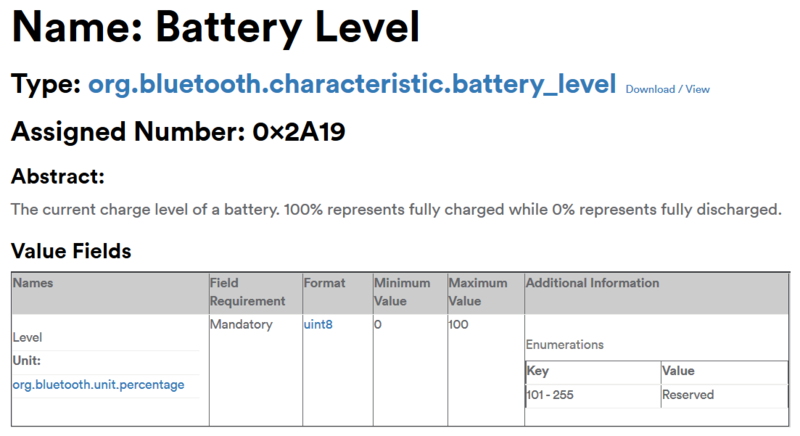 The documentation on the Bluetooth spec home page lists the number 0x180F as assigned to the Battery Service. As you can see, the 4th discovered service is 0x180f – the Bluetooth service we’re looking for. Now that we have found our Battery Service, let’s get the characteristics. These define the individual operations that the service offers. Some can have read access, others can also be written to. The characteristic also defines the format (number, text, …) and minimum and maximum values. The Battery Level characteristic is a uint8 with a minimum value of 0 and max of 100 (percent). Its assigned number is 0x2A19. Once we have identified the service and the characteristic we’re interested in, we can read its value – which is the battery level we want to find out. To make sure you’re allowed to read a characteristic value, you should check the access flag. On the Surface Dial, you’re only allowed to read the battery level when paired to the device. The kontakt.io beacon (based on Firmware version 4) allowed reading the battery level without pairing. In the code above, you can see how the buffer is read and converted to a byte array, which is then converted to a string. For my kontakt.io beacon, this returned the value 0x64, which means 100 in decimal; a fully charged battery. While the Microsoft Bluetooth LE Explorer app is not yet available as code sample, you can already download it from the Windows Store. 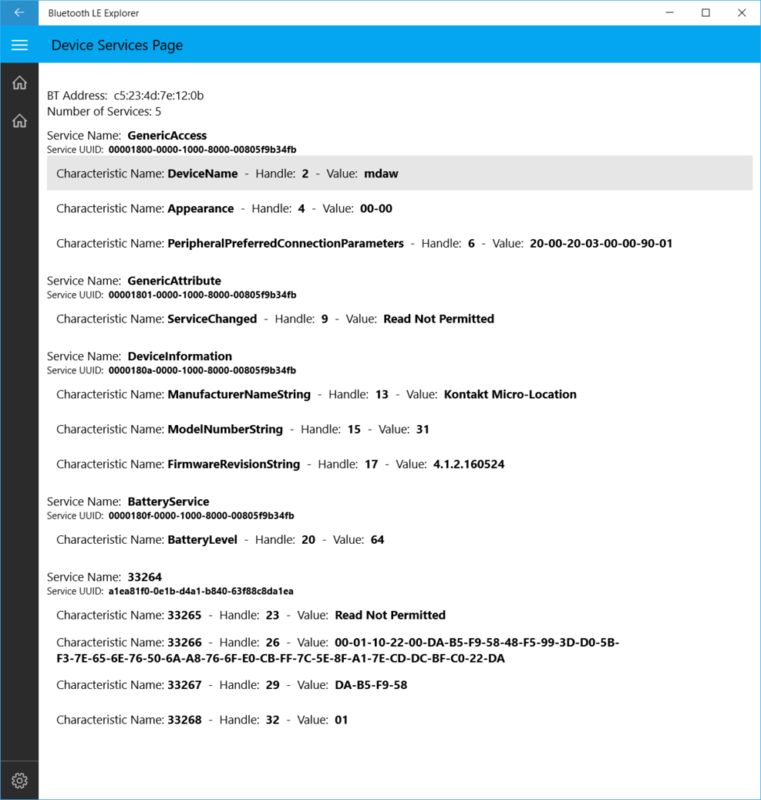 Based on the principles explained in this blog post, it reads and visualizes the Bluetooth services of Bluetooth LE devices. These are the services the tool discovers from an unpaired Surface Dial. You can see that the BatteryLevel characteristic doesn’t allow reading: Insufficient Authentication. You’d need to pair to the device first to get permission to read the battery level. These are the results of querying a kontakt.io Bluetooth beacon. The battery level is readable without pairing, its battery is fully charged (0x64 = 100%). The beacon also defines a custom (non-standardized / recognized) service – some of these custom services are described in the kontakt.io blog.